Typhoon MELOR made landfall at Chita Peninsula in Aichi Prefecture after 5 AM JST. At this moment, some areas from Kinki to Kanto is within the storm wind (>50kt) circle. Rainfall is increasing at many places; in particular heavy rains are observed in Osaka, Mie, Tokyo and Saitama Prefecture. In terms of winds, the maximum wind of 32.7m/s and the maximum gust of 44.2m/s was observed at Sentorea in Tokoname City, Aichi Prefecture. According to tide observation information in Tokai Region, this morning the tide level departure of 150cm was observed in Toba, 180cm at Akabane, and 120m at Nagoya. It was lucky that the peak of the tide level departure occurred between high and low water levels, so the highest water level did not reach historically high levels. 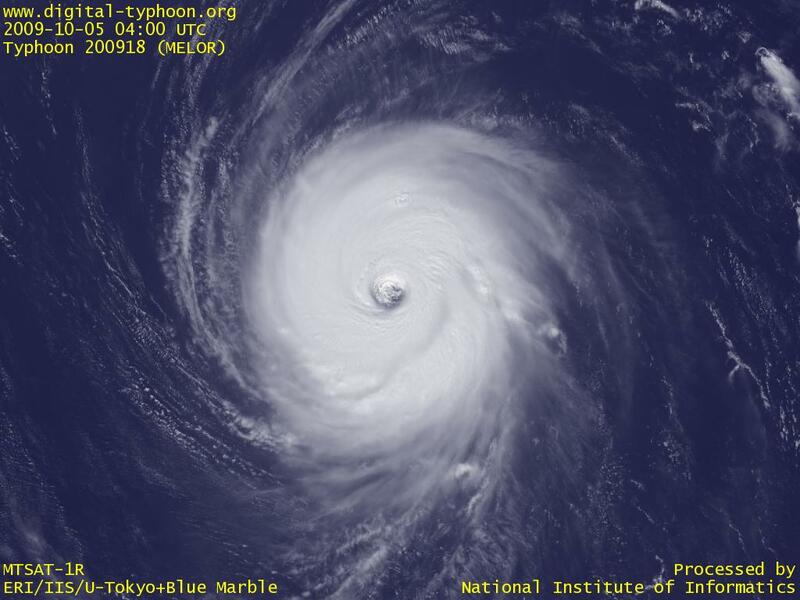 Typhoon MELOR is passing about 60km to 70km west of Daitojima Islands. We have three AMeDAS observation stations in this area; namely, Kita Daito, Minami Daito, and Kyuto. Among these stations, Kyuto recorded the drop of wind speed around 23 PM of 6th which is indicative of the eye, and Minami Daito seems to pass the peak around 0AM of 7th with the wind speed of 38m/s (952.6hPa). Due to this very strong winds, 75 percent of the houses in Daitojima Islands were now in blackout. 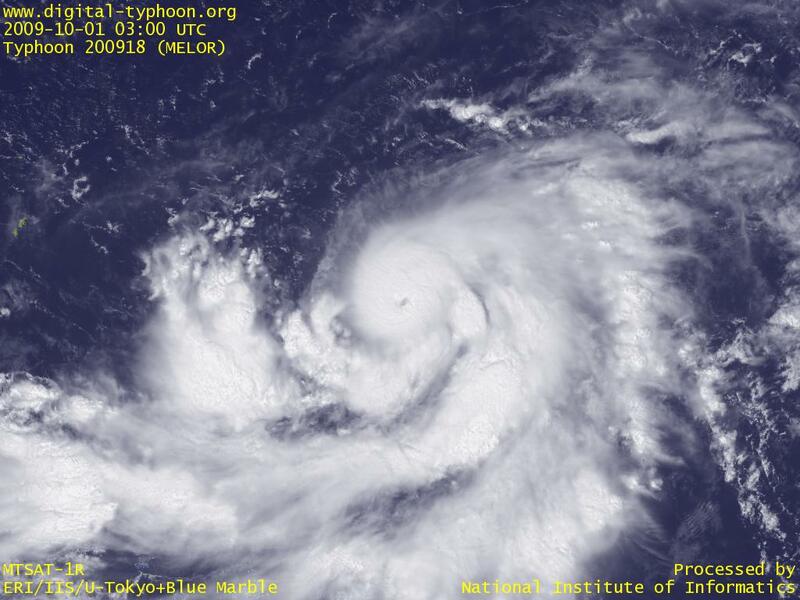 Typhoon MELOR has a rounded eye and a rounded cloud shape, and clouds near the center are very well developed. At this moment, the typhoon is located near Okinotorishima island, but finally the movement of the typhoon is turning toward northwest. The typhoon may strike Daitojima Area tomorrow night, and considering the intensity of the typhoon, winds and rains in that area will be extremely severe. The forecast track indicate the landfall of the typhoon at some place of mainland Japan, but the typhoon has the probability of making landfall at any place between Kyushu and Kanto, and it is too early to point to a particular place. 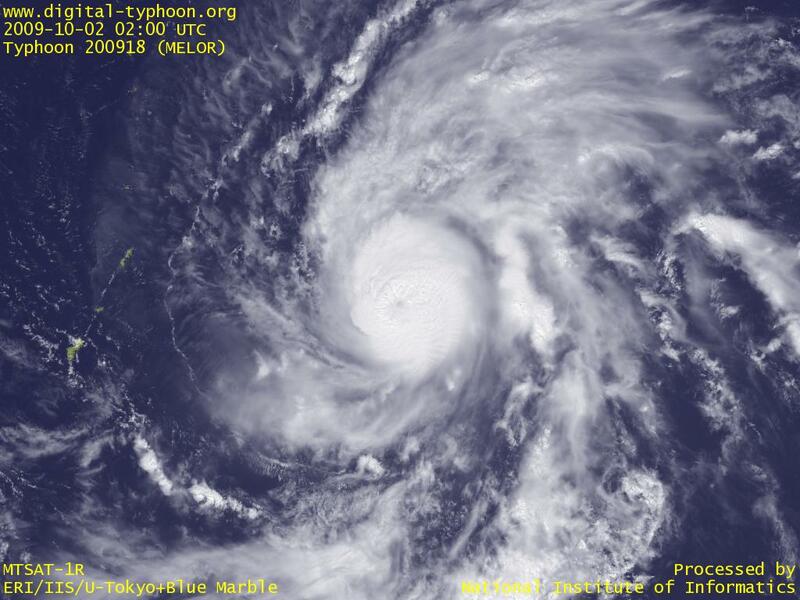 Typhoon MELOR has reached peak intensity after passing Northern Mariana Islands. 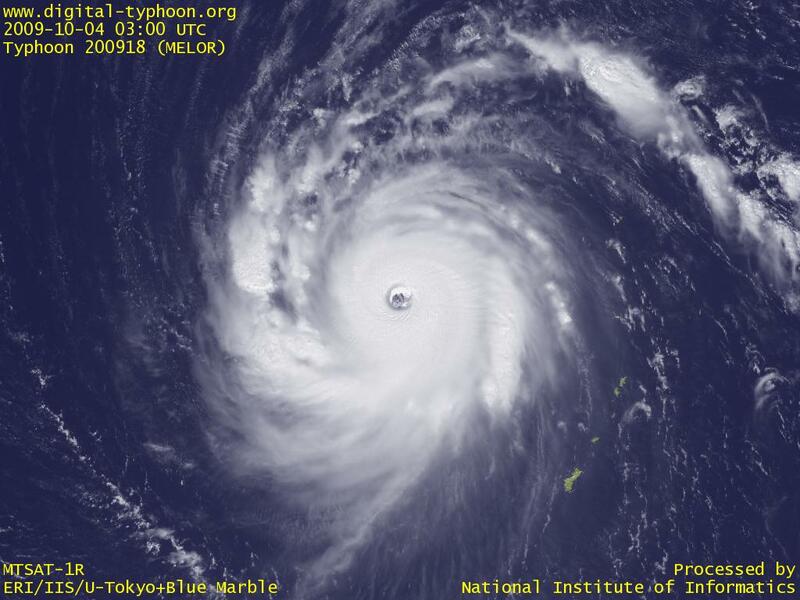 The image below indicates the very strong intensity of the typhoon with a clear eye and well-developed clouds around the center. 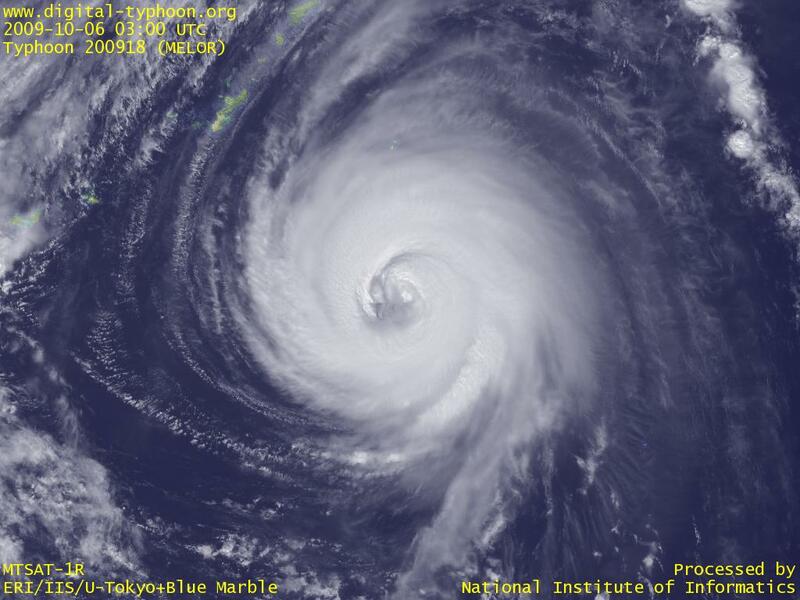 The typhoon is moving west, and may draw near to Daitojima while keeping this very strong intensity. Typhoon MELOR is now located closes to Northern Mariana Islands, and Google Earth shows that the typhoon is passing near Anatahan Island, which is about 110km north of Saipan. Saipan is in the southern tip of the storm wind circle (more than 50kt), but its position is a little far from the center of the typhoon. Typhoon MELOR is taking a relatively southward track in the forecast circle, and it may draw very near to Saipan when the typhoon keeps this southward track. This typhoon has intensified into a very strong typhoon, and a typhoon of this intensity requires the maximum level of preparedness. Typhoon MELOR is now located at Chuuk (Truk) Islands, and is forecast to draw near to Northern Mariana Islands. The forecast track is similar to Typhoon CHOI-WAN that passed in north of Saipan Islands recently. The typhoon is still in the intensification phase, and this typhoon may become larger in size than Typhoon PARMA in the future. 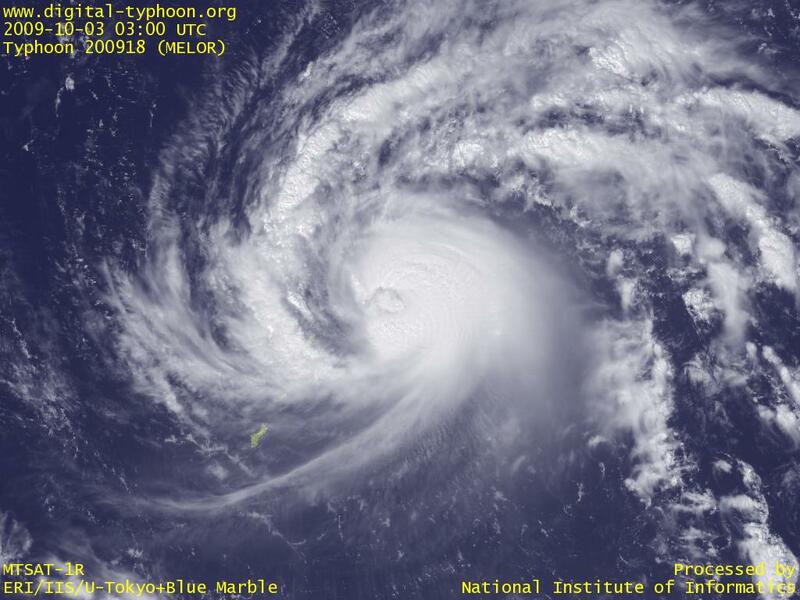 Typhoon MELOR was formed in Marshall Islands. At this moment Pacific Ocean is crowded by tropical cyclones, and there is another tropical depression between this typhoon and Typhoon PARMA (this is different from Typhoon KETSANA that made landfall at Vietnam). Because three tropical cyclones are packed into relatively small areas, we need to pay attention to how they are going to interact with each other.